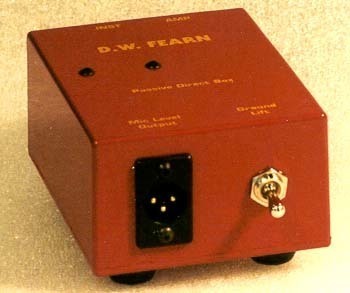 The D.W. Fearn PDB passive direct box enables one to take an instrument signal such as guitar, bass, or keyboard, and convert to level of a microphone level signal for attachment to the mic input of a recorder or mixer. Featured also is a 1/4" jack for routing to an amplifier input in order to hear playing through an amplifier as well as hearing through monitors or PA. This is an excellent tool for live performance or studio use! The D.W. Fearn flagship red finish is delightful!